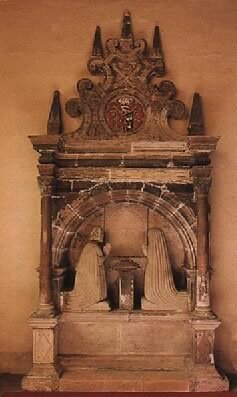 "Underneath are interred the remains of Margaret the wife of David Yale Esq., daughter and Heiress of Edward Maurice of Cae Mor, Gent. She departed this life the 20th day of December 1754, aged 66. Also lie the remains of David Yale Esq., who dyed Jan. 29th 1763, aged 81." "In memory of Mr Hugh Yale alderman of this town and Dorothy his wife, daughter of Roger Roden Esq., of Burton in the county of Denbigh whose bodies are interred in ye chancel of theis Church commonly called St Mary's before its demolition in the late wars, anno 1616. They gave to ye poor of this town the yearly interest and benefice of one hundred pounds to continue for ever, besides other good acts of charity." It is likely the word chancel was interposed for chapel: the old, pre-Civil War church included a chapel dedicated to St Mary, which was situated between the Tower and the old South Transept.